Since Disney Frozen released last year and Bubble and I went to see it in the theaters, it’s been a pretty foregone conclusion that she would want to be Elsa for Halloween this year. 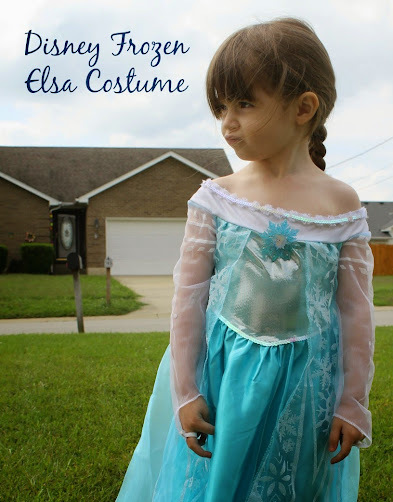 What I didn’t realize, though, was that she would also want to dress up like Elsa every. single. day. While singing “Let It Go” and doing the, as I call it, “Elsa flip” with her hair. 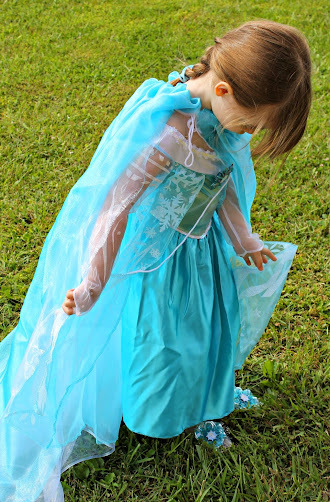 Finding Elsa costume pieces was nearly impossible for awhile. I truly don’t think even Disney anticipated just what a magical hit Frozen was going to be, and demand vastly overwhelmed supply. So we made due with Bubbles using the little blue shawl and hat Aunt Sherri sent us to wear last winter, and Bubbles used one of her blankets as a cape. Disney often sends out those free printable activity sheets and coloring pages that I try to share with you all. I also make sure that I download and safe them for later, myself, as you never know when they’ll come in handy. 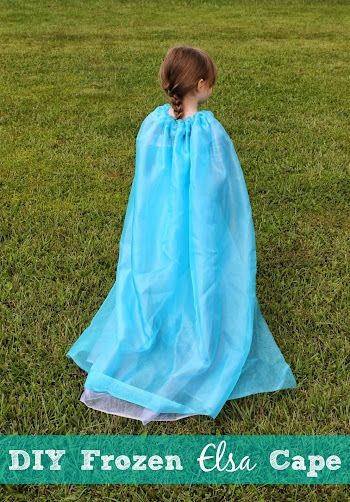 Last year they put out one with a tutorial for an Elsa cape, and I just finally came across it again and decided to try my hand at a DIY Elsa cape – no sewing needed! These are my modified instructions from the original ones shared by Disney. I found that some of the changes I made made it a lot easier to complete, as well as fit better. Hopefully it will work just right for you! 1) Start by laying out the two pieces of material, one on top of the other. Trim up any jagged or mis-matched edges. 2) At the top of the cape, lay out a length of yarn across the entire edge, leaving yourself 2-3″ inches of overhang on either end. 3) Fold the two layers of material down over the yarn (about 2″ of material) and run a stitch from one side of the cape to the other, creating a pocket or channel for the yarn. 4) Pull the yarn, gathering the material around your child’s shoulders, then tie. It’s actually a fairly easy DIY project, even if you don’t have any sewing experience. I found 1 1/2 yards of each to be more than enough for this cape; to be honest, I probably could have used less but this will grow with her a little bit. 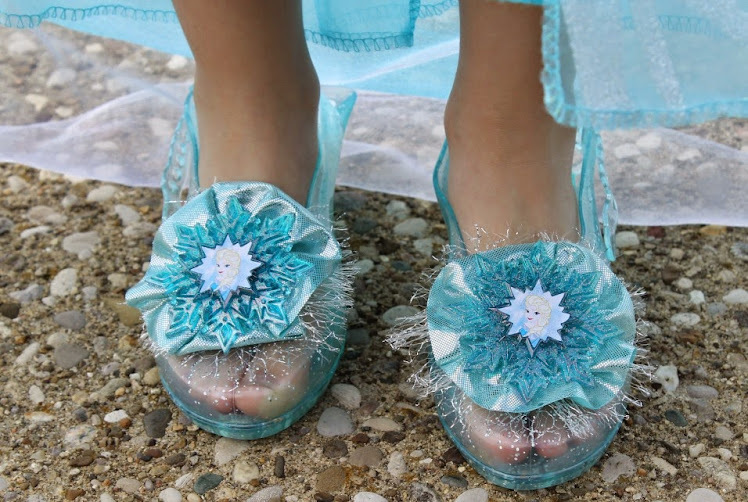 To complete the look, we ordered an Elsa costume plus some cute Elsa shoes. 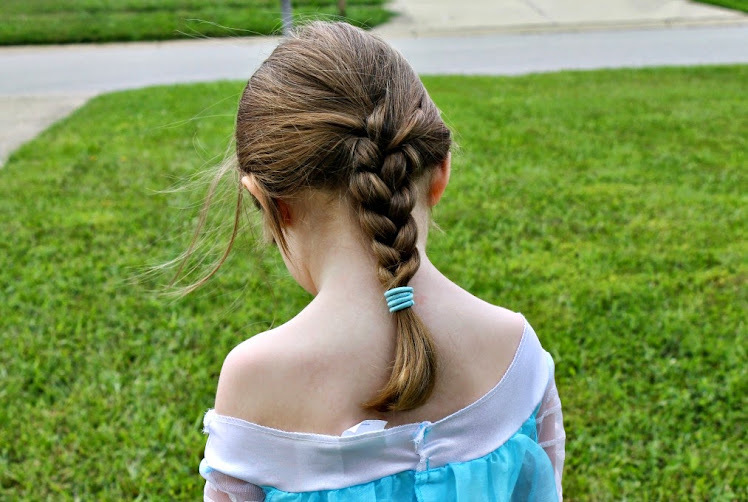 Then, of course, she had me braid her hair “like Elsa’s”. I think the look is pretty adorable! 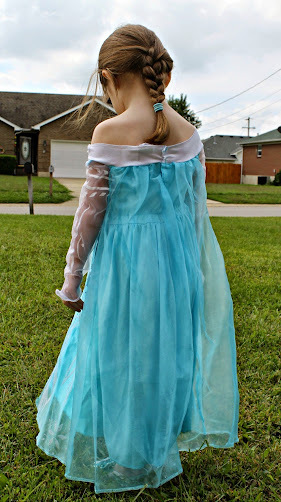 The Elsa costume is one of the nicer ones I’ve seen and actually seems like it will hold up to a little bit of princess twirling. 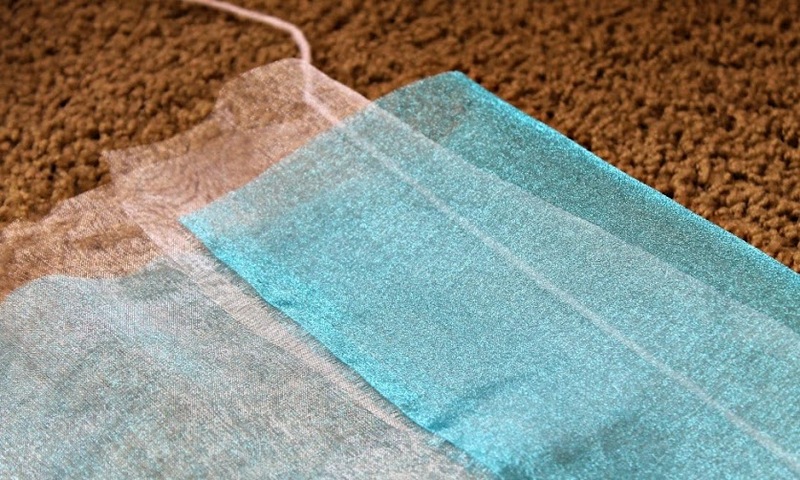 For whom would you make a DIY Elsa cape? My six year old would love this Liza. Thank you. Pinning this one to my Disney board. THIS IS SO CUTE! I just did a Frozen birthday for my little one last weekend! Disney On Ice Presents Princesses & Heroes in Louisville! New Tomorrowland Movie Starring George Clooney Coming Soon!